The Atlanta Hawks' John Collins (20) drives to the basket against the Brooklyn Nets' Rodions Kurucs during the first half of Wednesday night's game in Brooklyn, N.Y. The Atlanta Hawks' Trae Young drives past the Brooklyn Nets' D'Angelo Russell during Wednesday night's game in Brooklyn, N.Y.
NEW YORK — The Brooklyn Nets already showed they can fight their way out of tough times, having left an eight-game skid behind last month — so a 19-point deficit certainly wasn't going to deter them. D'Angelo Russell scored 23 points, Ed Davis grabbed a season-high 16 rebounds and the Nets climbed out of their early hole to beat the Atlanta Hawks 116-100 Wednesday night. DeMarre Carroll added 17 points to help the Nets improve to 21-22 with their eighth victory in their past nine home games. They managed only 20 wins for the entire season just two years ago, but they have engineered a big turnaround after a slow start to this season. On Wednesday, they did the same thing in the game. The Nets yielded 46 points in the first 15 minutes, then held the Hawks to 37 points over the next 25 minutes. John Collins had 30 points and 14 rebounds for the Hawks, who may have run out of steam after their strong start while playing a night after a close loss in Toronto. Rookie guard Trae Young had 17 points and seven assists, and Jeremy Lin added 16 points. "I think we came out with the momentum from last night's game," Hawks coach Lloyd Pierce said. "A lot of energy, a lot of movement, a lot of pace, attacking downhill, and then we just ran out of gas." The Hawks jumped to a 13-4 lead behind two three-point plays from Collins, who scored 12 points in the first quarter to help Atlanta open a 38-23 lead. 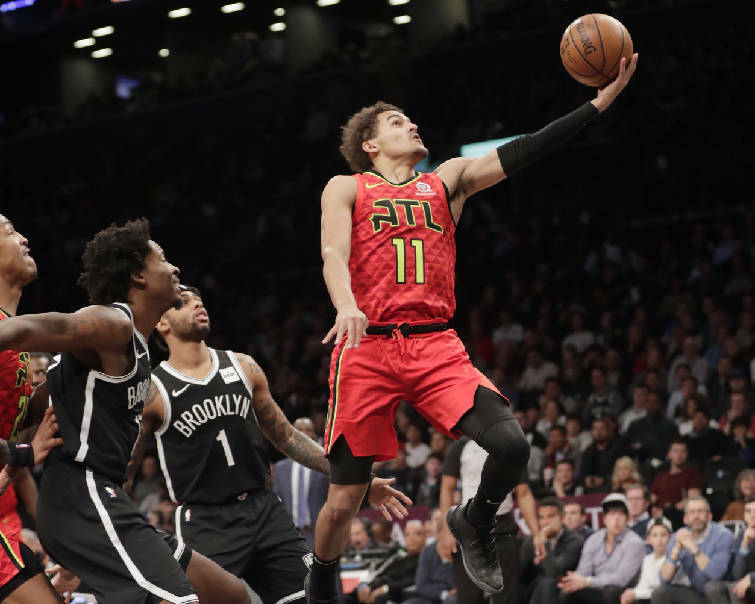 The Hawks extended their lead to 46-27 on Young's three-point play after his steal about three minutes into the second, but the Hawks stalled from there and Brooklyn trimmed its deficit to 57-51 by halftime. The Nets then got the first basket of the second half, and the Hawks called timeout just 18 seconds in. Harris knocked down three 3-pointers over the next few minutes as the Nets moved ahead after trailing the entire first half, and they gained control for good by scoring the last nine points of the third quarter, capped by Davis's three-point play, to bring an 86-80 edge to the fourth. "Guys just vocalized that we needed to pick up the energy, just compete harder," Harris said. "That's all it really boiled down to. It had nothing to do with Xs and Os, making shots, anything like that. It was just competing harder, and we did a better job to help us in the defensive end in the second quarter."